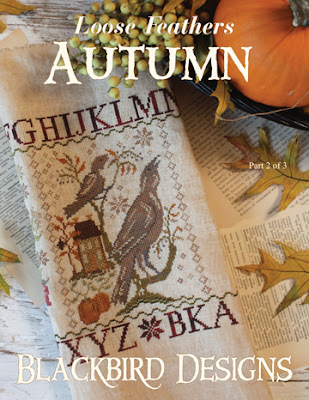 Autumn, the second pattern in our Loose Feather series, is at the printer and will be in the warehouse next week. It will probably take another week for your local shop to get the pattern....so in 2 weeks you could be stitching instead of raking leaves. Although, raking leaves can be fun too! Especially when the weather is nice. Barb has been busy working on quilts! We've done photography for our next quilt book and are working to finish it up as market quickly approaches. Well....must go for now. Will be back soon with more information about the quilt book and some show and tell also! It's beautiful! Don't you just love Autumn? Love the new design ~ I hope Primitive Gatherings gets this pattern in. I also like the Raven Bewitched in the previous post. Love it! Fall is my favorite time of the year. Looking forward to this and your new quilt book. That is a beautiful pattern, love the shades you used. Thanks for the peek - what a lovely design! Amazing! 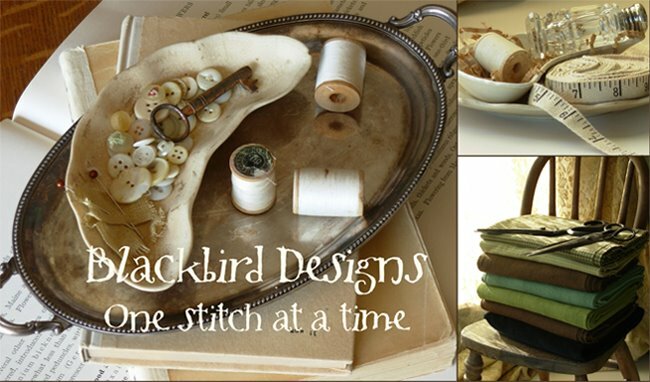 I love Blackbird Designs! Hugs! I love this pattern thank-you for such beautiful work. Is this book getting ready for Market? Yes, yes???? O, will bring an extra suitcase to bring it all back home. Love to meet you there! Oh pretty!!! Love it -- and I can't wait to see the new quilt book too! Can't wait to see this at my LNS! Thanks a lot for your lovellies charts !!!! Very very beautiful !! I love both new designs ! Be sure to purchase these designs from your local needlework shop. Purchasing from discount sites will eventually make shops extinct.